You want the chance to see those stars in the sky, especially if you’re from the city and usually don’t have the chance to see many stars. If you haven’t traveled far (i.e., your backyard), simply try to find a spot that isn’t too close to your house. You want to feel as though you’ve actually gone somewhere and let your imagination do the rest. Flashlight? Check. Journal? Check. Sleeping bag? Check. Portable gaming system? No check. Be selective when you’re packing that bag. What do you really need to survive, and what would help you truly enjoy being outdoors under those stars? The answer should not be technology, as that can be enjoyed at home. Immerse yourself in the moment and enjoy the experience of camping while you can! A tent is not as secure as a house or apartment, so you are a bit more vulnerable outdoors. For safety, we suggest camping with a group or at least one other person. That way, there is some guaranteed help in case of an emergency. 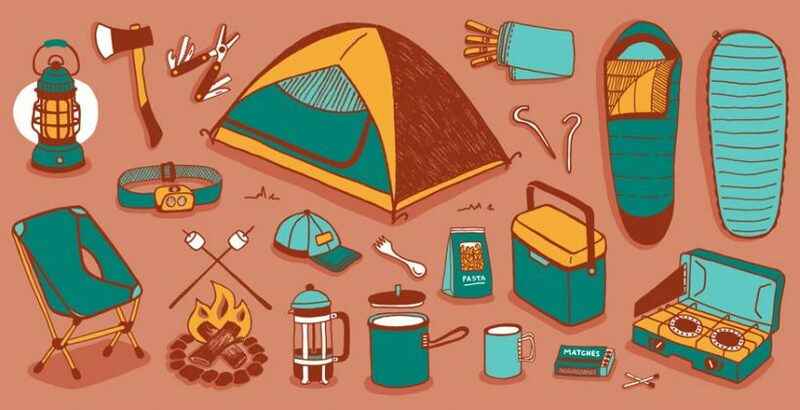 In addition, camping is much more fun with others! Be ready to enjoy each other’s company without distractions. Be ready to ask those deep questions you’ve always wanted to ask. You can be fully present with others when camping. Gathering around a campfire to listen to a great story is one of the simplest, most wonderful experiences you can ever have. The campfire has this effect of bringing stories to life. You can almost see the events you hear right in flames before you. Think of a story of your own to tell, too. We cannot say for sure, but there is a great chance that stories told next to a campfire will be remembered. We hope you enjoy your camping experience – there really is nothing quite like it!